Welcome back to MLS, Jozy Altidore, and hopefully Toronto FC make the smart move and allow you to be a Red for many years to come. Personally, I would take Altidore over Jermaine Defoe any day and I hope the rumors are not true of letting him go to another MLS team to allow Toronto to sign Italian forward/attacking midfielder Sebastian Giovincio, who I don't feel would be a better long term fit for the club. Is Altidore a better player then Defoe or Giovincio in terms of World Class? No, although there are a number of positives associated with Altidore that make him a strong signing. He is young, at 25 years of age. He is American so will not count for an international roster spot. He has played in MLS before, scoring 15 goals in 36 games before the age of 20. He has showed he can score a high number of goals a season with 23 in 2012-2013 with AZ Alkmaar and combined for 38 in 69 games with the Dutch side. He should also match up well with Gilberto, as both strikers have speed, but Altidore is more of a target man who scores most goals from inside the 18 yard box, which could lead to more opportunities both outside and inside the box for Gilberto that Defoe couldn't supply. It is true that Altidore ended his failed English Premier League career with only two goals in 72 games and will probably go down as one of the worst striker signings all time in that league. His recent output does raise some concerns, although I think there's two main reasons why Altidore failed in England that will not be an issue in MLS. First, the clubs Altidore was with in the English Premier League, Hull City and Sunderland, were both clubs fighting against relegation which meant there is pressure on both the club and the manager to get results. 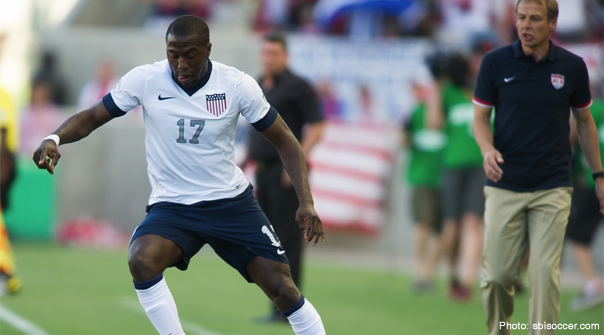 Altidore is not the first, nor will he be the last to fail under this pressure. Ideye Brown, a striker with great potential who scored regularly with Dinamo Kyiv in Ukraine, has one goal in his first 11 EPL games. While Aston Villa are beginning to raise questions about Christian Benteke, who only has two goals in 12 games this season. Meanwhile in the EPL, players with far less talent have proven to score in similar situations like Charlie Austin for example, which I feel is due to their greater awareness and what to expect regarding soccer in that country. The other issue which could raise more concerns, although I don't feel will be an issue in MLS, is Altidore was simply out muscled by most defenders in the Premier League. Altidore was fouled almost three times per 90 minutes of play while in the Premier League. Both during his time in the MLS and the Dutch Eredivisie, Altidore was the bully, which led to more shots and goals including 10 headed goals in the Eredivisie, where he scored none in the EPL. MLS doesn't have the athleticism of defenders that exist in the Premier League or the Eredivisie or the Soccer IQ of most defenders in the Premier League, so Altidore should be able to use his strength as an asset again. He will be stronger then most in MLS, he will also have better control and movement in the box. What he lacks compared to Defoe is the guaranteed finishing, although as I said, I think he will provide more opportunities than Defoe because of the attention the opponents defenders will put on him during the game. As I wrote in my potential DP's to Toronto FC I would like to see before the 2014 season article, I feel Altidore will be a consistent double digit yearly goalscorer in MLS and if he returns to his full potential he could score 20 plus goals a season and even sold back to Europe for a profit. I think the signing of Altidore could also secure the long term career of Micheal Bradley in a Toronto FC jersey. Although Altidore and Bradley never crossed paths in Major League Soccer, they both came from the New York Metrostars organization with Altidore joining the first team after Bradley left for Holland. Bradley and Altidore have played a number of games with the US National Team, including this assist from Bradley to Altidore against Nigeria prior to the World Cup last summer. One of the concerns last season is we knew Defoe, Bradley and Gilberto were good players, but we didn't know how they would play together. Going into this season, some DP players could provide a sure option for TFC. A World Class central defender could definitely help the club, or a true attacking midfielder who can be an asset on set plays in both scoring and providing. Despite having him as a prospect three years ago at Parma, I don't feel Giovincio provides this, although he would be very exciting if he was a replacement to Gilberto. Known as mighty-mouse for his 5'4 height, Giovincio is a very exciting player who loves to both shoot and cross and his goal and assist totals come more from this effort then his finishing ability. Giovincio provides a great asset to many teams, including ones who are world class, but is a difficult player to base a team around. Ironically similar to Altidore joining MLS, what the Philadelphia Union tried and failed to do with Freddy Adu a couple of seasons ago. Part of a strong soccer awareness is knowing what you are, and although there are many exciting players around the World available at this salary, only a few can provide a club long term stability. I feel Altidore is a player you can build an MLS team with and my guess is most MLS clubs would want to use him as that player. Hopefully Toronto FC also see this potential and we can look at the whole Defoe situation as a blessing in disguise as the bargaining chip that create the Toronto FC spine of Altidore and Bradley for many years to come.